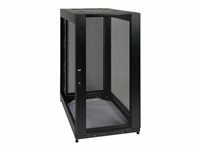 This SmartRack 12U Mid-Depth Rack Enclosure Cabinet protects sensitive electronic equipment from harsh conditions that would overwhelm a typical rack enclosure. It is deal for use in factories, construction areas, utility plants, warehouses and other areas with limited space that are high in moisture, dust and debris. It can protect your equipment from falling dirt, dust, drips, splashes and accidental contact with personnel. On the front door there is a built-in dust filter. The filter is removable and can be replaced with standard furnace filters - they're simple, inexpensive and effective. To compensate for the added air resistance of the filters, there are 4 large, high performance intake fans in the front door. The fans pull air through the enclosure, from front to side. 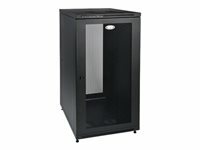 Adjustable rack rails with square mounting holes accommodate up to 12U of standard 19" rackmount equipment. Supports up to 1000 lbs of equipment.